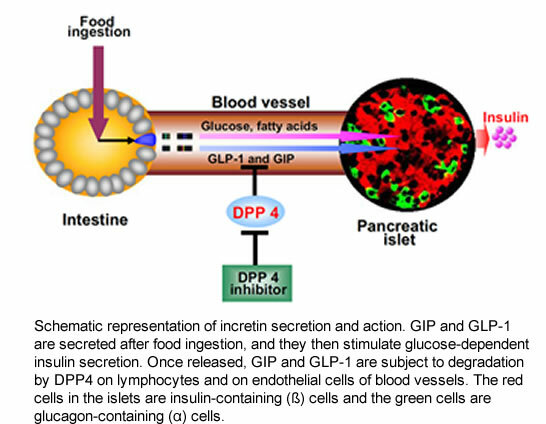 Glucose is transported into pancreatic β-cells by facilitated diffusion. High levels of intracellular glucose in pancreatic β-cells also stimulates Ca2+-independent pathways that further increase insulin secretion. 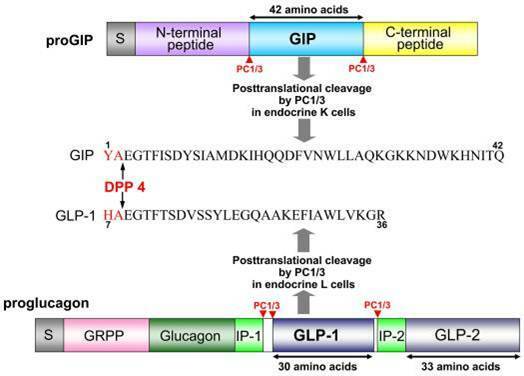 Binding of GLP-1 to its receptor promotes insulin release via intermediates such as PKB, and also increases β-cell mass via improved cell survival and decreased apoptosis. Post-translational processing of proglucagon in the intestinal L cell and the pancreatic α cell. PC1/3 is responsible for the processing of proglucagon in the L cell to release GLP-1 and GLP-2. Kim W, Egan JM. Pharmacol Rev. 2008 Dec;60(4):470-512. Epub 2008 Dec 12. Cardioprotective properties of omentin-1 in type 2 diabetes: evidence from clinical and in vitro studies. Greulich S, Chen WJ, Maxhera B, et al. PLoS One. 2013;8(3):e59697. doi: 10.1371/journal.pone.0059697. Epub 2013 Mar 29. Adipokines are linked to the development of cardiovascular dysfunction in type 2 diabetes (DM2). In DM2-patients, circulating levels of omentin-1, an adipokine preferentially expressed in epicardial adipose tissue, are decreased. This study investigated whether omentin-1 has a cardioprotective function. Omentin-1 levels in plasma and cardiac fat depots were determined in DM2-patients versus controls. Moreover, the relation between omentin-1 levels and cardiac function was examined in men with uncomplicated DM2. Finally, we determined whether omentin-1 could reverse the induction of cardiomyocyte dysfunction by conditioned media derived from epicardial adipose tissue from patients with DM2. Omentin-1 was highly expressed and secreted by epicardial adipose tissue, and reduced in DM2. Circulating omentin-1 levels were lower in DM2 versus controls, and positively correlated with the diastolic parameters early peak filling rate, early deceleration peak and early deceleration mean (all P<0.05). The improved diastolic function following pioglitazone treatment associated with increases in omentin-1 levels (P<0.05). In vitro, exposure of cardiomyocytes to conditioned media derived from epicardial adipose tissue from patients with DM2 induced contractile dysfunction and insulin resistance, which was prevented by the addition of recombinant omentin. The clinical utility of C-peptide measurement in the care of patients with diabetes. C-peptide is produced in equal amounts to insulin and is the best measure of endogenous insulin secretion in patients with diabetes. Measurement of insulin secretion using C-peptide can be helpful in clinical practice: differences in insulin secretion are fundamental to the different treatment requirements of Type 1 and Type 2 diabetes. This article reviews the use of C-peptide measurement in the clinical management of patients with diabetes, including the interpretation and choice of C-peptide test and its use to assist diabetes classification and choice of treatment. We provide recommendations for where C-peptide should be used, choice of test and interpretation of results. With the rising incidence of Type 2 diabetes in younger patients, the discovery of monogenic diabetes and development of new therapies aimed at preserving insulin secretion, the direct measurement of insulin secretion may be increasingly important. Advances in assays have made C-peptide measurement both more reliable and inexpensive. In addition, recent work has demonstrated that C-peptide is more stable in blood than previously suggested or can be reliably measured on a spot urine sample (urine C-peptide:creatinine ratio), facilitating measurement in routine clinical practice. The key current clinical role of C-peptide is to assist classification and management of insulin-treated patients. Utility is greatest after 3-5 years from diagnosis when persistence of substantial insulin secretion suggests Type 2 or monogenic diabetes. Absent C-peptide at any time confirms absolute insulin requirement and the appropriateness of Type 1 diabetes management strategies regardless of apparent aetiology. Kover K, Tong PY, Watkins D et al, PLoS One. 2013;8(3):e58767. doi: 10.1371/journal.pone.0058767. Epub 2013 Mar 11. Neuroendocrine regulatory peptide-2 stimulates glucose-induced insulin secretion in vivo and in vitro. Moin AS, Yamaguchi H, Rhee M et al, Biochem Biophys Res Commun. 2012 Nov 30;428(4):512-7. doi: 10.1016/j.bbrc.2012.10.073. Epub 2012 Oct 27. Neuroendocrine regulatory peptide (NERP)-2, recently identified as a bioactive peptide involved in vasopressin secretion and feeding regulation in the central nervous system, is abundantly expressed in endocrine cells in peripheral tissues. To explore the physiological roles of NERP-2 in the pancreas, we examined its effects on insulin secretion. NERP-2 increased glucose-stimulated insulin secretion (GSIS) in a dose-dependent manner, with a lowest effective dose of 10(-7) M, from the pancreatic β-cell line MIN6 and isolated mouse pancreatic islets. NERP-2 did not affect insulin secretion under the low-glucose conditions. Neither NERP-1 nor NERP-2-Gly (nonamidated NERP-2) stimulated insulin secretion. NERP-2 significantly augmented GSIS after intravenous administration to anesthetized rats or intraperitoneal injection to conscious mice. We detected NERP-2 in pancreatic islets, where it co-localized extensively with insulin. Calcium-imaging analysis demonstrated that NERP-2 increased the calcium influx in MIN6 cells. These findings reveal that NERP-2 regulates GSIS by elevating intracellular calcium concentrations. Adrenomedullin is up-regulated in patients with pancreatic cancer and causes insulin resistance in β cells and mice. Aggarwal G, Ramachandran V, Javeed N et al, Gastroenterology. 2012 Dec;143(6):1510-1517.e1. doi: 10.1053/j.gastro.2012.08.044. Epub 2012 Sep 6. New-onset diabetes in patients with pancreatic cancer is likely to be a paraneoplastic phenomenon caused by tumor-secreted products. We aimed to identify the diabetogenic secretory product(s) of pancreatic cancer. Using microarray analysis, we identified adrenomedullin as a potential mediator of diabetes in patients with pancreatic cancer. Adrenomedullin was up-regulated in pancreatic cancer cell lines, in which supernatants reduced insulin signaling in beta cell lines. We performed quantitative reverse-transcriptase polymerase chain reaction and immunohistochemistry on human pancreatic cancer and healthy pancreatic tissues (controls) to determine expression of adrenomedullin messenger RNA and protein, respectively. We studied the effects of adrenomedullin on insulin secretion by beta cell lines and whole islets from mice and on glucose tolerance in pancreatic xenografts in mice. We measured plasma levels of adrenomedullin in patients with pancreatic cancer, patients with type 2 diabetes mellitus, and individuals with normal fasting glucose levels (controls). Levels of adrenomedullin messenger RNA and protein were increased in human pancreatic cancer samples compared with controls. Adrenomedullin and conditioned media from pancreatic cell lines inhibited glucose-stimulated insulin secretion from beta cell lines and islets isolated from mice; the effects of conditioned media from pancreatic cancer cells were reduced by small hairpin RNA-mediated knockdown of adrenomedullin. Conversely, overexpression of adrenomedullin in mice with pancreatic cancer led to glucose intolerance. Mean plasma levels of adrenomedullin (femtomoles per liter) were higher in patients with pancreatic cancer compared with patients with diabetes or controls. Levels of adrenomedullin were higher in patients with pancreatic cancer who developed diabetes compared those who did not. Famulla S, Lamers D, Hartwig S et al, Int J Obes (Lond). 2011 Jun;35(6):762-72. doi: 10.1038/ijo.2010.212. Epub 2010 Oct 12. Pigment epithelium-derived factor (PEDF) is a multifunctional protein with neurotrophic and anti-angiogenic properties. More recently it became evident that PEDF is upregulated in patients with type 2 diabetes and also contributes to insulin resistance in mice. During characterization of the secretome of in vitro differentiated human adipocytes by two-dimensional polyacrylamide gel electrophoresis and matrix-assisted laser desorption/ionization-MS, we found that PEDF is one of the most abundant proteins released by adipocytes. The aim of this study was to investigate the regulation and autocrine function of PEDF in human adipocytes and to determine its paracrine effects on human skeletal muscle cells (hSkMC) and human smooth muscle cells (hSMC). Human primary adipocytes secrete 130 ng ml(-1) PEDF over 24 h from 1 million cells, which is extremely high as compared with adiponectin, interleukin-6 (IL-6) or IL-8. This release of PEDF is significantly higher than from other primary cells, such as adipose-tissue located macrophages (50-times), hSkMC and hSMC (5-times). PEDF protein expression significantly increases during adipogenesis, which is paralleled by increased PEDF secretion. Furthermore, tumor necrosis factor-α and hypoxia significantly downregulate PEDF protein levels. PEDF secretion was significantly reduced by troglitazone and hypoxia and significantly increased by insulin. Treatment of adipocytes and hSkMC with PEDF induced insulin resistance in adipocytes, skeletal and smooth muscle cells at the level of insulin-stimulated Akt phosphorylation, which was dose dependent and more prominent in adipocytes. Furthermore, inflammatory nuclear factor-κB (NF-κB) signaling was induced by PEDF. In hSMC, PEDF induced proliferation (1.7-fold) and acutely activated proliferative and inflammatory signaling pathways (NF-κB, p38 mitogen-activated protein kinase and mammalian target of rapamycin). PEDF is one of the most abundant adipokines and its secretion is inversely regulated by insulin and hypoxia. PEDF induces insulin resistance in adipocytes and hSkMC and leads to inflammatory signaling in hSMC. Because of these diverse actions, PEDF is a key adipokine, which could have an important role in diabetes and obesity-related disorders. Visfatin regulates insulin secretion, insulin receptor signalling and mRNA expression of diabetes-related genes in mouse pancreatic beta-cells. Brown JE et al, J Mol Endocrinol. 2010 Mar;44(3):171-8. doi: 10.1677/JME-09-0071. Epub 2009 Nov 11. The role of the adipocyte-derived factor visfatin in metabolism remains controversial, although some pancreatic beta-cell-specific effects have been reported. This study investigated the effects of visfatin upon insulin secretion, insulin receptor activation and mRNA expression of key diabetes-related genes in clonal mouse pancreatic beta-cells. beta-TC6 cells were cultured in RPMI 1640 and were subsequently treated with recombinant visfatin. One-hour static insulin secretion was measured by ELISA. Phospho-specific ELISA and western blotting were used to detect insulin receptor activation. Real-time SYBR Green PCR array technology was used to measure the expression of 84 diabetes-related genes in both treatment and control cells. Incubation with visfatin caused significant changes in the mRNA expression of several key diabetes-related genes, including marked up-regulation of insulin (9-fold increase), hepatocyte nuclear factor (HNF)1beta (32-fold increase), HNF4alpha (16-fold increase) and nuclear factor kappaB (40-fold increase). Significant down-regulation was seen in angiotensin-converting enzyme (-3.73-fold) and UCP2 (-1.3-fold). Visfatin also caused a significant 46% increase in insulin secretion compared to control (P<0.003) at low glucose, and this increase was blocked by co-incubation with the specific nicotinamide phosphoribosyltransferase inhibitor FK866. Both visfatin and nicotinamide mononucleotide induced activation of both insulin receptor and extracellular signal-regulated kinase (ERK)1/2, with visfatin-induced insulin receptor/ERK1/2 activation being inhibited by FK866. We conclude that visfatin can significantly regulate insulin secretion, insulin receptor phosphorylation and intracellular signalling and the expression of a number of beta-cell function-associated genes in mouse beta-cells. Intracellular nicotinamide phosphoribosyltransferase (iNampt) is an essential enzyme in the NAD biosynthetic pathway. An extracellular form of this protein (eNampt) has been reported to act as a cytokine named PBEF or an insulin-mimetic hormone named visfatin, but its physiological relevance remains controversial. Here we show that eNampt does not exert insulin-mimetic effects in vitro or in vivo but rather exhibits robust NAD biosynthetic activity. Haplodeficiency and chemical inhibition of Nampt cause defects in NAD biosynthesis and glucose-stimulated insulin secretion in pancreatic islets in vivo and in vitro. These defects are corrected by administration of nicotinamide mononucleotide (NMN), a product of the Nampt reaction. A high concentration of NMN is present in mouse plasma, and plasma eNampt and NMN levels are reduced in Nampt heterozygous females. Our results demonstrate that Nampt-mediated systemic NAD biosynthesis is critical for beta cell function, suggesting a vital framework for the regulation of glucose homeostasis. Revollo JR, Körner A, Mills KF et al, Cell Metab. 2007 Nov;6(5):363-75.